Update April 4th 2017: Both Grab (titled JustGrab it which will choose between taxis and GrabCar..cars) and ComfortDelGro are introducing flat rate trip booking on their apps. Jury is out on how these initiatives will go down with the consumers.. When we arrived in Singapore in 2011 we were beyond excited that we could access our phone and order a taxi from a couple of different apps; ComfortDelGro, Trans-Cab and SMRT Book a Taxi. Jaws dropped as we saw the little taxi on the map heading our way…we were used to Hong Kong where you had to hail the old fashioned way; this was ground-breaking stuff. Fast forward five years and a lot has changed; apps have appeared and apps have disappeared. Let’s take a look at how the whole scene is in March 2017. There was a time a few years ago when my “Taxis” folder was crammed full of apps. Hailo – dead. Gone. Lyft – appeared for a short time. Now unavailable. Don’t know if it will be back. Easy Taxi – dead. Ceases to be. Bulldozing onto the scene in 2013 Uber is now my usual go-to app. At first, getting a lift in a personal car was strange to get used to but now it’s second nature. Constantly battling with Grab for fare deals and competitive pricing lends itself to a cheap option for getting around Singapore. Branching off from their standard UberX private car option, Uber now offers UberPool (sharing the fare with other passengers), UberExec (fancy-pants option), uberXL (up to 6 peeps), ExecLarge (fancy-pants parties of 6), and you can now just order a taxi through their app. 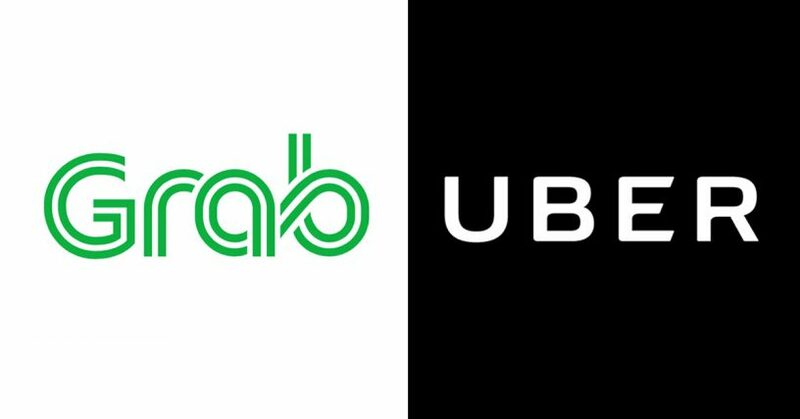 Launched in 2013 as GrabTaxi (renamed to Grab in January 2016 to encompass all the other options they offer), beating Uber by a couple of months, Grab was a game changer for…grabbing…taxis in Singapore. It gave us more taxis available to us as it pooled all the different companies’ taxis into one bookable engine. More taxis=more chance to get a taxi when we want. Like Uber, it dishes out fare deals and offers every few days in the quest to squash and kill any competition once and for all. Long may it last! And like Uber, it offers more options than it’s standard taxi option. It has it’s own Uber competitor (GrabCar), GrabHitch (like UberPool), GrabCar Premium (UberExec), Electric Taxi (interesting new option where you can fight against the oil giants and choose electric. Not many cars on this yet and still in Beta), a bunch of 6 seater options, and they’ve just started Coach hires. Other trials they are doing are with autonomous cars, and family friendly cars (with booster seat). Seems that Grab is branching out in a few more innovative and different directions than Uber at this stage. Let’s see! Nostalgia (and desperation) brings me back to this app once in a while but this is mostly long forgotten about with the power houses of marketing that Uber and Grab are. This is basically limited to Comfort’s own taxis. Again, this app is only limited to the SMRT line of taxis. I never use this as Grab gathers all companies together when booking. Never used it or use it now. It has only 5 thousand downloads on the Google Play Store and a rating of 2.2/5 stars. For Singapore’s second largest taxi fleet this is shocking. Also, they have recently announced they will introduce “dynamic pricing” which mirrors Uber’s Surge pricing and hikes the prices to hire a taxi when demand is high. Another loss for the customer. Generally speaking, a good time to be looking for a taxi/car in Singapore, ignoring the surge pricing when high demand hits and the magical disappearance of all taxis when a rain storm hits.